Brokencase: Any chance you could query the EEC-IV Chief about his experience resolving IAC issues that don't respond to absolutely every known standard remedy? On Scorpios, it's the damned Sudden High Idle Syndrome (akin to the infamous Audi sudden acceleration issue). On XRs, it's both erratic IAC operation and the high idle syndrome. A number of XR owners run with the IAC disconnected in frustration. The issue on both Merks likely has the EEC-IV seeing and responding to a phantom signal...but from where? My theory is that it's the TPS. I don't know EEC-IV very well (or at all...) but on most cars the idle valve interacts with the TPS so that the idle valve it doing it's thing as your foot comes off the throttle... When sitting at a stop with 0% throttle the idle valve is open a small amount, but as you dig into the throttle the idle valve opens more so that when your foot comes off the throttle the valve is positioned to let the revs down easy, which can reduce "trailer hitching" and improves emissions. My suspicion is that some TPS goof - wear or misadjustment - causes the engine management to think you're deeper into the throttle than you actually are, and the valve is opened in response. I *assume* that like other cars, with LAx ECMs improve on this by adding the VSS input so that the ECM knows for sure it's in idle mode because VSS = 0mph. It's really coincidence that you posted this thread, because just over the weekend I started researching that input... I think I'm going to redo my instrument cluster and get that VSS input to my LA3 to see if my random high idle goes away. Everyone I've known, Scorp or XR owner, with this issue has installed new TPSs, to no avail. Ditto IAC solenoids. Dotto new (Motorcraft often) ECTs. TPS settings (XRs) were set, and reset, to no avail. Throttle bodies were cleaned. TB and intake manifold gaskets were replaced: mounting bolts were retorqued. Vacuum hoses were replaced. To no avail... On the Scorpio, EGR and EGR control solenoids were replaced. To no avail. Just today I swapped IAC harness plug for a used one which tested equal 1.8 ohm resistance in each wire length, suspecting my original plug might have some broken strands where it curves at the plug. To no avail. I didn't have this issue on this XR (fully stock) until about two years ago. I decided to install an 8UA EVU with Big Vam I had asleep in my stash as the TB ECUs were 16 bit compared to 8 bit stock XR thinking that might help. I connected all 8UA ECU pins properly (ACT sensor: BOO, ...). To no avail. This morning after swapping IAC harness plugs the engine fired and ECU quickly sensed IAC connection and controlled the idle as expected on startup. A minute or two later still parked I switched A/C on and ECU adjusted nicely for that. Moved onto and down the street and before a mile of pavement slid under the car i could feel the rpms were higher at very low pedal push than they should have been. Another mile with 2-3 stop light waits and the idle control felt like it was wide open. So again I stop, kill the engine, and unplug the IAC. What did work for me, so far, re Scorpio sudden high idle was an engine swap unrelated to the sudden high idle. I can only speculate why that was/is still. The VSS signal theory seems to me a rabbit hole as I assume/think when the LAx ECU sees no VSS signal and TPS and VAM signals show no calls for more fuel it should allow (non A/C on) idle speed to be unmodified by it. I'm glad you chimed in on this. And we're not alone on it either. Yep, I have replaced literally the entire fuel injection system (every component, virtually all of the wires), had the engine apart and back together numerous times, tested it fully for leaks and abnormalities and nothing appears out of spec ever. But I get the sudden high idle at random times - sometimes days or weeks between incidents and sometimes every trip for days in a row - and it always goes away as suddenly as it appears. The fact that 90% of the time everything is *perfect* and 10% of the time it's not, I'm confident that a) everything is in the best tune & adjustment it can be and b) it's weird, raggedy edge of something that results in the oddity. I don't have an in-depth knowledge of electronics, but I have a decent grasp of primitive fuel injection systems and a basic understanding of what happens when you mix low voltage systems (like 5v TPSs) with aging electronics and unpredictable resistances & voltages. Weird stuff! I mean, it could be something as stupid as a wack voltage regulator in the ECM supplying 5.5v or 4.8v and throwing everything off. It doesn't take much. So, to be clear - I don't necessarily think there is something that could be done with the TPS on early EEC to fix the random high idle, but I do believe the random high idle is a result of a crap TPS/ECM interaction. I won't be able to test that theory since I've got an LA3, but I've been living with a reasonably reliable idle wackiness for 10 years and if adding a VSS keeps it from coming back - which I think it very well might based on my knowledge of Bosch systems - then I'll be satisfied. In my experiences enduring this syndrome, XR and Scorpio, when it occurs the rpms want to surge to 3K and hold there if the transmission is moved to neutral. That extreme rpm level is highly unusual even for cold starts in below zero weather, IME. It suggests the IAC is full bore wide open. That sharp, even severe, a response suggests to me it can't be speed signal related. Possibly a phantom command from somewhere else in a harness invading the IAC wiring. I wonder if it's a diode malfunction... Brokencase has knowledge of them; I assume his contact The EEC-IV Chief has both knowledge and test bench perspective on them. It would help if they could be brought into this conversation. I have never experienced that... my high rpm will vary but usually between 1200 and 1500rpm. Never higher. Again, I don't know much about EEC-IV, but on contemporary Bosch systems the idle valve maxes out under 2000rpm - usually around 1700 or so. The same is true for most of GM's 80s fuel injection systems. I have real doubts that any idle valve could open up wide enough for a 3000rpm run... what would the point be of an idle valve with that sort of range? 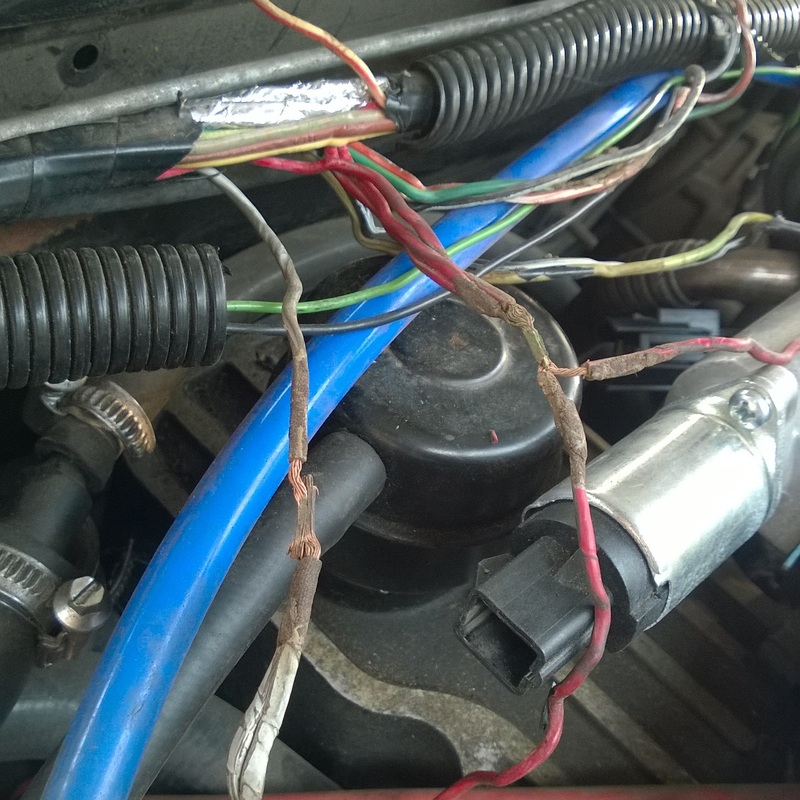 Note that when I stop and shut off the engine and disconnect IAC harness plug, restart and drive on the syndrome no longer recurs. On a Mazda GLC (non computer controlled) I drove for years the cold start idle had rpms rise towards 3K for initial seconds before settling to a more typical ~1200-1500 rpm level. So I speculate that the 3K rpm represents an ECU command for severest cold start conditions which should be reduced sharply after 2-3 seconds, but isn't. Recall that 80's Audis experienced "sudden unintended acceleration", definitely more than a simple high occasional idle. The Audi SUA case ("sudden unintended acceleration" is the common legal descriptor) wasn't real... It was proven over and over again it was an illegitimate suit. No expert was ever able to replicate that behavior, and in fact the thing that screwed over Audi was a faked 60 Minutes report where they engineered a vehicle to accelerate for the camera. The takeaway from that case was that it was likely pedal confusion, which happens a surprising amount. In fact, it was specifically demonstrated that the idle system in the Audi could not produce the behavior reported... and that's been borne out in my relationships with Saabs, Volvos, and BMWs (as they all share similar fuel injection). On some old carb'd cars, "really high idle" was definitely a thing especially as they aged and things got weird. My Falcon could definitely get a very high idle til I replaced the mechanical choke with an electric one. But that shouldn't factor into any fuel injected vehicle. I've certainly never experienced it in any car from any make, and that's across virtually every brand sold in the US across the last several decades. I've not owned a Nissan... I think that's it. I mean, maybe it happens on XRs, but I've never experienced that. Just a few hundred unwanted rpm. You haven't owned Scorpios from my reading of your posts; "sudden, unresponsive high idle" is a known if quite random syndrome on only some Scorpios for which no lasting solution has been identified. Scorpio and XR ecu and fuel and air systems (at idle).are for this discussion identical. The IAC and TB idle ports are 1/2", twice as large as what you posited alone could not produce severe high idle.That port fully open together with the throttle body butterfly to bore clearance set for normal idle is substantial. Yes, like Bosch valves. But the passageway inside is much smaller. It's not perfect (being 2D) but you can get a sense of what the valve & seat looks like. It's quite a small passageway. Bosch valves work differently, but they share 1/2" I/O but a narrow air passage in the middle. I'm sure there is some good reason for the design, but I'm not smart enough to know what it is. Every manufacturer had a different approach to these valves - some being better than others - but in my experience in all cases the point of the valve was to improve cold start (with a high idle capability) and make up for additional load on the engine, like alternator, automatic transmission, or air conditioning. The range of operation of these things is pretty narrow - they are not designed to run the engine (that's why there is a base idle setting for the throttle butterfly) but make up for "a few hundred rpm" drag. I'm definitely not saying you're not seeing a 3000rpm idle from your valve, just that a) I haven't, and b) if you are, I'd guess something else is off. My problem is *purely* the valve randomly opening wider than it should by a few hundred RPM. That's all I got, that's all I'm trying to fix. I've separated IAC solenoids from the valves to thoroughly clean them as regular maintenance many times over many years. I depress the pintle valve, spray cleaner on/around it, release, cover air intake/exit shake, repeat, inspect internals with flashlight. I measured the pintle bore; it's 7/16ths, just 1/16th less than the intake/exit ports 1/2". That coupled with base idle butterfly setting allows enough extra air for rpms to rise (very lean burn naturally). So thrust is a bit less than with everything operating normally. My tach reads up to 3K in idle when the issue appears. My tach is accurate through full range . Those rpms are not fully fueled; they're largely if not totally air fed (IAC unplugged egine runs normally). If you've ever experienced a large vacuum leak while driving (I have on an older non XR car) it's the same effect, the engine revs higher than normal without pedal pressure. Yes the IAC does control idle speed, as with an auto trans where when stopping for a light e.g. with brake pedal depressed thecIAC keeps idle speed at or just above base idle. Add to that when the engine fan comes, ditto: add to thise when a/c is on the IAC compensates to raise idle further. It does that by metering additional air flow directly into the TB. Very cold weather start compensation is large. I don't get why you think "something else is off". I unplug the IAC, everything works normally. That's a hard datum point. IAC doesn't modulate anything other than air flow to the TB. That 7/16th pintle valve bore, fully open, equates to a vacuum brake booster hose disconnected and ducking air directly into the intake. My theory has been this: the IAC wiring is wrapped along with TPS and some other sensor/switch wires. Voltage from one of those leaks to or affects somehow the IAC wires. Ford used shielding on electrical wiring in harnesses to the distributor/TFI and another location I don't recall just now but have noted in the EVTMs. There are documented instances of troubles caused when that shielding is faulty or missing. I thought the same - when doing some other work I found much of the wiring above the valve cover totally decimated - insulation turned to dust and severe corrosion of the wires. The diode inline with the IAC crumbled in my hands! I unwrapped and took the wire back to the battery, replacing with new. Replaced the diode, replaced the connector at the IAC. While there are some shielded wires in the harness, the IAC does not appear to be one of them. I don't specifically understand how this IAC works but I assume being a simple solenoid (vs a stepper, etc.) it's on or off and pulsed at a specific frequency to allow more or less air through. If that's the case, it shouldn't be terribly susceptible to electrical noise, and so I'm not surprised it's not shielded. In any case, a couple feet of new wire and professional replacement yielded no improvement. I was hopeful, then I was crushed. It's possible that some other signal that should be shielded is getting screwed up and the ECM is making poor decisions... the logic certainly holds since "random high idle" was not one of the myriad complaints about these cars in the '80s, so it does seem age-related. It'd be interesting if summary replacement of the EEC ECM with a Megasquirt (PIMP etc, whatever) cured the issue... exonerating the components and pointing a finger at the ECM. That's not on my short-term to do list, but it'd be a good experiment. I think in the world at large, funky idle is not generally an EEC fault, just an XR fault. But IDK. Edit: One thing I remember: I assume the diode inline with the IAC is there to protect the driver in the ECM, and I can't help but wonder if years of poor or no diode damaged the driver and has caused this problem for me. I junkyarded another LA3 with reman stickers on it, so I think it's a good candidate for "undamaged LA3" but I've not gotten around to installing it. It seems a stretch, but it's definitely part of this experiment. I was running with the original ECM (PF. PK, I forget; auto trans '88) whrn the issue first appeared. I swapped that out and ibstalled an 8UA thinking it could resolve the issue. Nope. But I LOVE the 8UA! I have two LA3s in my stash I've never installed. I could try swapping one or both in place of the 8UAto see if the idle issue changes in any way. The diode question is why I wish Brokencase would chime in here (see his recent Scorpio posts), and maybe also bring the issue to The EEC-IV Chief for advice. What specifically about the diode?